Since time immemorial, human beings have this tendency of decorating their home spaces with beautiful artifacts. The trend continued with passage of time and gained pace with the advent of latest technological advancements in the artifact and floor covering industry. Well, with environmental issues springing up, production of more eco friendly options is underway to supplement the growing environment needs and sustainability on our surroundings. Eco flooring is the viable choice considering the level of energy consumption and global crisis adversities. No doubt, it cannot replace the non eco flooring absolutely, yet is has opened up doors of possibility into a world that is green and futuristic. Sisal flooring is a landmark innovation in the field whereby Agava, a kind of cactus is cultivated and its fibres are extracted then dried and dyed to produce carpets and rugs that are an all natural alternative to the preexisting synthetic flooring options. Synthetic floorings are hazardous to our health and the environment with landfills with heaps of waste. 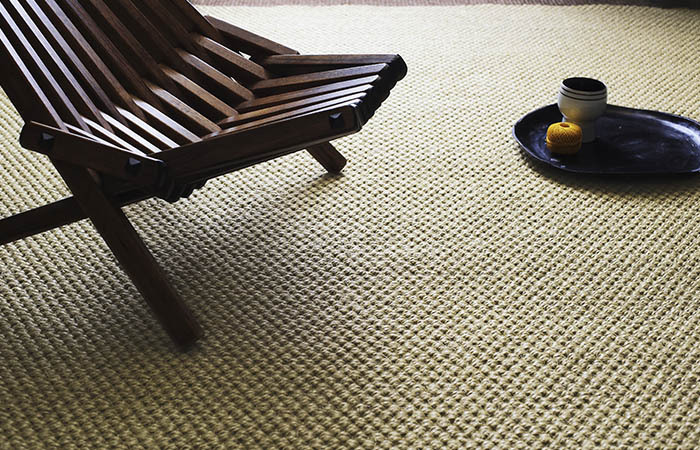 Floorspace has come up with ecofriendly sisal flooring that encompasses a wide variety of rugsand carpets with all new designs and exquisite patterns that will sweep your feet away. Sisal flooring is amongst the best green home flooring alternative which is100 percent recyclable, can employ natural backing and can be bought untreated and doesn’t require toxic chemicals for its cleaning. Floorspace Sisal flooring is available in distinctive varieties of rugs and carpets. These are renewable, reusable and recyclable. You will not require any adhesives with most of them and in case you do, you may exercise the choice of using non toxic adhesives or some other mode of installation. It is naturally resistant to stain which implies you can ward off any concerns about chemically treating it when your naughty kids spill upon it. Go with the healthy option of sisal flooring as it is dust mite resistant and anti static as opposed to synthetic floorings. Sisal is prominently known for its anti static characteristics. It has super smooth texture that you will relish the instant you put your foot on the carpet or rug created from sisal. Sisal is highly durable, tough, sturdy and long lasting. Also, it has superior sound absorbing qualities which make it an expert option to be used in living rooms,bedrooms, office spaces, and staircases. It can endure hard wear and tear exhibiting extraordinary strength. It looks great even after continuous usage for years. On top of everything, it comes in variety of designs. Buying your sisal flooring is very affordable if you purchase it from floorspace.com. They offer you the best prices and discounts on floorings of superior quality and panache. It has achieved an excellent reputation for making high quality products, including sisal floorings and varied other natural flooring alternatives. As they always say, every coin has two sides, a rosy and seamy one. Similarly, though sisal floorings are great and perfect for your home, yet it comes up with some words of caution. It is not recommended to be used in kitchens or bathrooms or areas prone to moisture. So, go purchase a different fiber instead if you wish to have flooring for these places. Can You Skip Hiring Help When Moving Home?